For almost half his life, Eli Cooper struggled to climb out of the cracks in the Canadian mental health care system. Five years ago, just shy of age 31, Eli decided he was too tired to continue. In his memory and in celebration of his passion for baseball, each year Eli’s Uncle Blue (AKA David Bluestein) treats two dozen children from under-served communities to a Blue Jay’s game. For most of them, it’s their very first live Jays game and trip to the Rogers Centre. 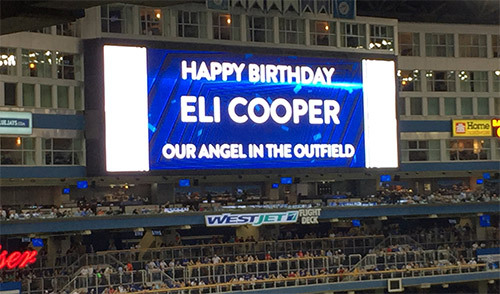 This year, the fifth annual event even coincided with Eli’s actual August 4 birthday. To top it all off, the Jays won 3-1 against the visiting Minnesota Twins! 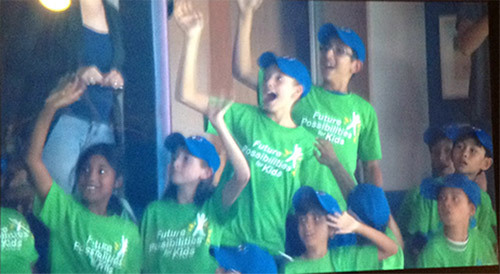 The children, chosen through the Toronto-based non-profit Future Possibilities for Kids, watched the game in the Blue Jays private box, enjoyed dinner and snacks, and were thrilled to see themselves waving on the Jumbotron to the attending 36,000 fans.